Created in 1871 as the United States Commission on Fish and Fisheries, to investigate causes for decreases in commercial fish landings, to recommend remedies, and to oversee restoration. 1851-1896. Zoologist whose specialty was the natural history of fish (an ichthyologist). Read More reviewed each of the fisheries, and his and other studies resulted in guidelines for protecting the fish stocks. Formerly a term used for vessels that set line trawls, it has come to be the universal term for any fishing boat or vessel that tows nets. Dragger is the common New England term. The first trawlers were steam powered, but as soon as large enough internal combustion engines became available in the years after World War I, they converted and all new trawlers had gasoline or diesel engines. was launched in Massachusetts in 1903. Steam trawlers brought their catch to market faster, and mechanical ice-making also encouraged the market for fresh fish. An internal combustion engine developed by German Rudolph Diesel and patented in 1892, aimed at high efficiency. In fisheries, fishing conducted further than 3 miles from land. These generally require larger vessels for overnight passages and work. of a week or less. Engined vessels were ideal for dragging or towing trawls. In New England these are called draggers. 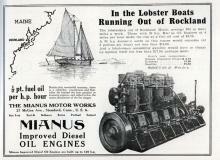 After World War II, inexpensive surplus diesel engines became popular and put the specialized marine engine companies out of business. 1886-1956. Developed the quick food freezing process after watching Inuit use freezing to preserve food in Labrador. He started a company in 1924 to develop quick-freezing machines for his newly-established General Seafoods Company in Gloucester, Massachusetts. In fishing, a large ship that takes in the catch from smaller ships for processing or preservation at sea.. Fish could be processed immediately, and the ready availability of frozen fish helped increase public demand. The result was increased depletion of both well-known kinds of fish and of species that had previously been unmarketable. Derived from Sound Navigation and Ranging Device. An apparatus used in locating submerged submarines, consisting of a transducer and receiver attached to the hull of a ship. Read More was used to find fish after World War II. In 1960, huge foreign factory trawlers began to fish as close as three miles from shore. They systematically targeted species after species, catching and processing fish at the same time. Small local fishermen were being driven out. The 1976 passage of the Magnuson-Stevens Fisheries Conservation Act effectively banned foreign fleets, setting a new 200 mile offshore limit. Within the Act, however, were the seeds of self destruction, for it encouraged modern vessel building and made it easy to borrow money for construction. Between 1976 and 1987, the New England fleet's killing power doubled. Regulations did not keep up, and groundfish stocks started the collapse that we now see. Today, the ecological consequences of towed nets are apparent in habitat destruction and juvenile mortality, both predicted as early as 1914. Closed areas are helping stocks recover, and work is being done on revisions of the management act, now in its 16th edition. The real question is whether the fishery can ever become even a fraction of what it once was. In addition to sonar, today even more sophisticated electronics allow fishermen to locate fish, and depletion of fish stocks has increased even more. A major issue for our times is how to satisfy the demand for fish while rebuilding depleted stocks. An edible crustacean, Homarus americanus refers to the species found in the North Atlantic.. Aquaculture can cause pollution through high concentrations of fish and fish food, and may present hazards to navigation and unsightly views. There is also the risk of interbreeding between wild and domestic strains. Maine's department which is in charge of marine resources and is charged with enforcing coastal fishing regulations. Passed in 1976, with modifications up to 1996, the Magnuson-Stevens Fishery Conservation and Management Act gave the United States exclusive fishery management power in waters out to 200 miles from its shore. It gives authority to the Federal government to set conservation policies which it does through the National Marine Fisheries Service..
Common name for marine invertebrates: crustaceans such as lobsters, mollusks such as clams, echinoderms such as sea urchins.. Lobster, however, is Maine’s most valuable fishery.